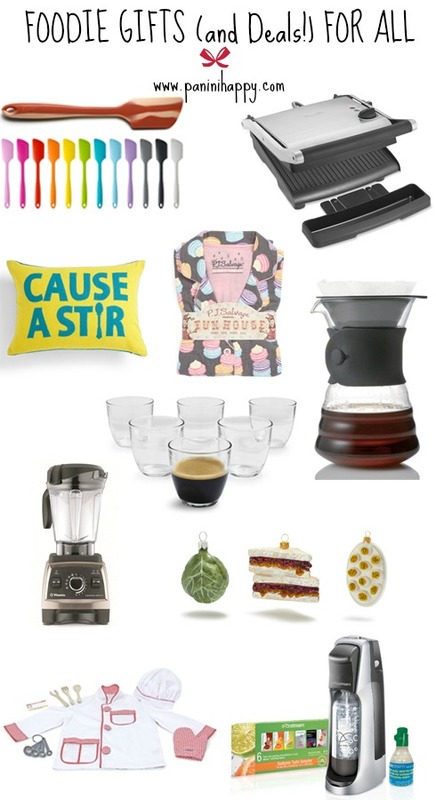 If you’re like me and you still have a bit of holiday shopping to do, allow me to give you a few of my best foodie gift ideas! Most of these are items I personally own and love, so I hope that your family and friends (or perhaps you!) will love them too. Where possible, I’ve also identified deals and discounts that I’ve come across. I’ll do my best to keep them all current, but it’s always possible that pricing may vary from what’s listed here, depending on sales and promotions offered by the retailers. Enjoy! Of course, I’m always going to recommend a panini press. 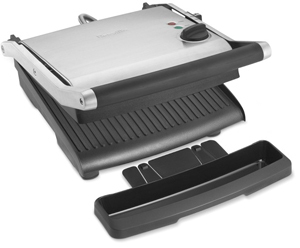 🙂 Everyone asks me which one to buy – my top picks are the Breville Panini Press and the Cuisinart 5-in-1 Griddler. 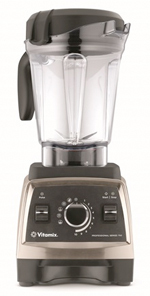 Each of those brands also offer more compact (Breville Panini Duo Press and Cuisinart GR-35 Griddler Compact) and higher-end models (Breville Smart Grill and Cuisinart Griddler Deluxe), depending on your budget. Round out your gift with a copy of The Ultimate Panini Press Cookbook (buy it on Amazon, or you can buy an autographed copy directly from me!). 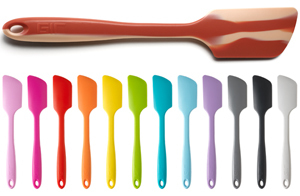 I have a bucket full of spatulas, but my GIR silicone spatula is my absolute favorite to use. Its unibody style gives it a more sturdy feel than traditional rubber spatulas – the handle isn’t going to slip out, like with my old spatulas, and it’s got a really comfortable grip. These make excellent stocking stuffers. As you can see above, it comes in a variety of colors – including a bacon version! (The bacon one is only sold on the GIR website – all the other colors you can get on Amazon). 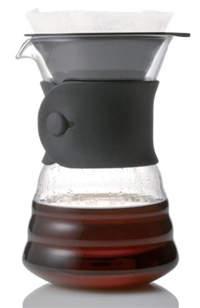 After a bit of research, I bought a Hario V60 Drip Decanter recently and I couldn’t be happier with it. The pour-over method is one of the simplest and best ways to brew an excellent cup of coffee. It’s actually kind of enjoyable to slowly pour the water into the top and watch (and smell!) as it passes through and extracts flavor from the ground beans. Give one of these decanters with a pound of your favorite coffee and a mug! This Cause a Stir Throw Pillow stopped me in my tracks while I was shopping at Nordstrom with my friend, Tany, the other night. How cute is that? 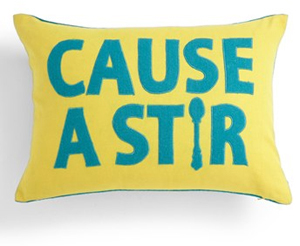 It’s perfect for anyone who loves to cook (or otherwise “stir the pot”, lol). One of these years I’d love to decorate an entire Christmas tree with food ornaments. 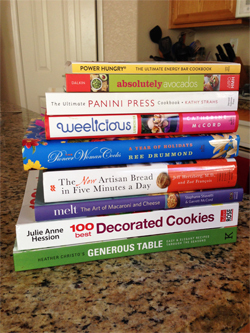 That would be my excuse to go crazy over the 100+ food ornaments at Sur La Table. Seriously – a plate of deviled eggs?? I wonder if they’ll make a panini press ornament next year…hmmmm. After each of my orange juice glasses, one by one, broke in the dishwasher I shopped for new ones — durable ones. 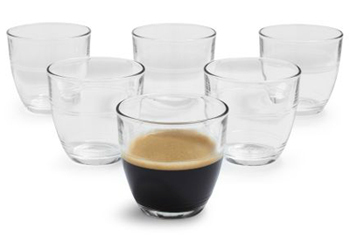 I bought a set of Duralex Gigogne Tumblers at Sur La Table because they were described as “shatterproof” and a “perennial favorite of French mothers” (sounded like a good thing!). I love these glasses! They’re nice looking, sturdy and stackable (I’m saving lots of space in my cabinet now). I nearly impulse-bought these P.J. 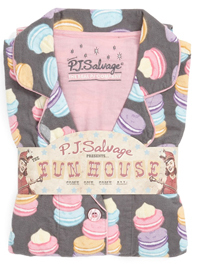 Salvage Macaron Flannel Pajamas at Nordstrom the other night (the aforementioned shopping trip with my friend, Tany). Macaron motifs just make me happy (as do the cookies themselves!). I did my best to be good – I try not to buy myself presents when I’m shopping for other folks – but I’ll tell you what, if Santa doesn’t end up bringing these for me, there’s a good chance I’ll be back for them after Christmas. 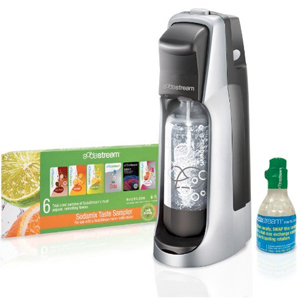 The Sodastream was one of my favorite gifts I received last Christmas. You can make carbonated drinks in seconds. I mainly use it to fizz up plain water, but it also comes with a number of syrups and other flavor mixes. 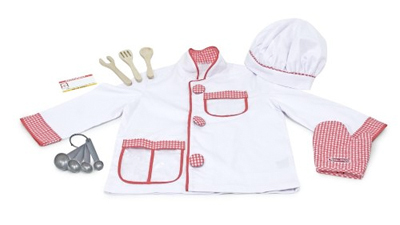 Since my almost 4-year old isn’t reading yet, I suppose it’s safe to write that Santa will be bringing him the Melissa and Doug Chef Costume this year. I think he’ll get a kick out of it – pretty much every time I get ready to cook, he drags a stool over next to me to help! I’ve bought a several other Melissa and Doug costumes over the years, I love the quality. Power Hungry, by Camilla Saulsbury — Make your own delicious and highly nutritious energy bars at home. Absolutely Avocados, by Gaby Dalkin — A must for avocado lovers, or anyone looking to cook healthier. Weelicious Lunches, by Catherine McCord — Healthy, delicious options for packing your kids’ school lunches. The Pioneer Woman Cooks: A Year of Holidays, by Ree Drummond — Family favorite recipes for celebrations throughout the year. The New Artisan Bread in Five Minutes a Day, by Jeff Hertzberg, M.D. and Zoë François — Make your own amazing artisan bread every day, through a simple method that only requires five minutes of active prep time. Melt: The Art of Macaroni and Cheese, by Stephanie Stiavetti and Garrett McCord — An in-depth exploration of mac and cheese that goes way beyond just casseroles. 100 Best Decorated Cookies, by Julie Anne Hession — Step-by-step tutorials on how to make fun and festive decorated sugar cookies for any occasion. Heather Christo’s Generous Table, by Heather Christo — Seasonal recipes and entertaining advice for gatherings throughout the year. Purchases made through the affiliate links in this post will return a small commission to support Panini Happy. Many thanks! I love those ornaments and the jammies. Cute! I’d jump for joy over any of these gifts. Great selection.